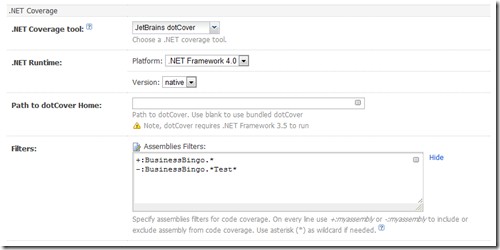 During our BizzBingo project we use NUnit and since TeamCity 6.0 is Jetbrains dotCover also directly integrated. How dis would look like you are getting to know now. This ScreenShot is from Nightly Build and there is nothing special in it. You need to adjust it depending on your project but here is nothing special to beware on here. We take the Source over the SVN interface from Codeplex. Because we are building the whole SLN with "Debug" the results are shown in our source tree in the adequate bin folder. 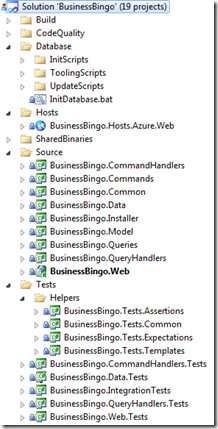 With Wuildcards the runner will found our tests like for example BusinessBingo.Commandhandler.Tests.dll and run them. If we decide to add more tests to our project they will appear automatically in the Build - "Convention over Configuration". 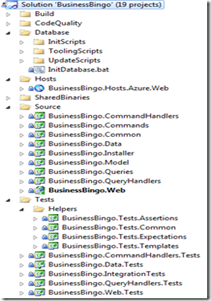 Now the Unit tests run... let´s talk about dotCover. With the filter you instruct dotCover which Code should be recognized for the CodeCoverage during UnitTesting. Important: don´t declare ".dll" here just the name. With "+" you say: search assemblies with this name (also Wildcars) and "-"means that there are no CodeCoverage. Normally it doesn´t exist and because of this the error appeared. After this it works. Useful and easy and it doesn´t take a lot of time.